Nothing adds to the pleasure of riding your bike like awesome music, but getting good sound on a motorcycle can be difficult. Depending on your style of bike, space for stereo components is almost always extremely limited. There are several ways to go to get the best sound into your available space. If you have a fairing, then you have the best chance to install audio gear something similar to what goes into most cars. Many fairings will come with a cutout already there for a head unit and speakers. It’s important to check those measurements before you buy, however because there really aren’t any standard sizes, especially when it comes to speakers. Your first inclination might be to buy car audio gear for your bike, but consider that the equipment might be exposed to rain and splashing that wouldn’t happen inside of a car. Your might be better off to look at marine stereos and speakers like those offered on this website. Waterproofing varies, so you will want to pay attention to the specs. 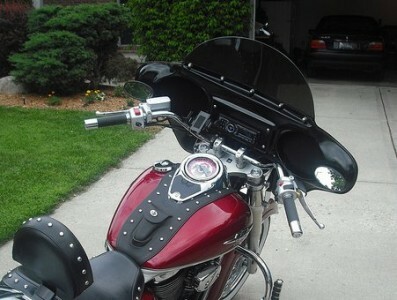 If you don’t have a fairing, there are a number of good handlebar mount type systems available. These usually make use of waterproof bullet speakers. Check out rocktheboatmarinestereo.com for more info on waterproof marine speakers. These bullet speakers are small, but they can put out a surprising amount of volume. Don’t expect huge bass response, though as there just isn’t enough resonance in the tiny cabinets to produce much thump. A small amp that can play music from your iPod or smart phone is a good option. Many of these will clamp to your handlebars as well.